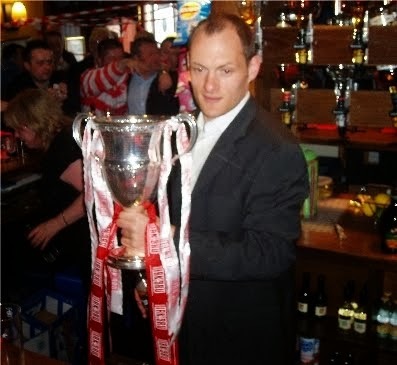 Yesterday Accies effectively handed the league title to Dundee. It is small consolation that Dundee felt they had given it to us a week before, as we're a week closer to the end, and this time it's more likely to count. Yes, it is still theoretically possible for Accies to win it, but it's unlikely, and it's out of our hands. Dumbarton has rarely been a happy hunting ground for us. But our record there is not as bad as some say: we won there, in the cup, as recently as last season, and truth be told, we haven't played them that often in the last decade, due to being in different divisions. However, yesterday's big crowd, and the sense of anticipation that we could be on the verge of a title, contrived to create a big sense of let-down. The thing is, we actually came very close. With quarter of an hour to go, we were at 1-1. At that point, we felt that would be a bad result, but it would have been much better than what finally happened. We spent the early part of the second half bombarding the Dumbarton goal, and although they looked quite dangerous on the break, we had most of the play and spurned several great chances, notably a hazy Crawford dribble into the box, which I thought he'd finished, and Longridge one-on-one with the keeper. As we went into the last quarter of an hour, Alex Neil clearly felt it was time to gamble, withdrawing a midfielder, Gillespie, for another striker, Antoine-Curier. Many of our fans prefer Neil as our manager to Billy Reid precisely for this sort of choice: in the same situation, would Billy have gambled? I doubt it, and with the benefit of hindsight, it wasn't the right choice by Neil. But at the time, it was a gamble I think most of us supported. Cooler analysis suggests it might have been better to hold on for a draw, perhaps sneaking a winner if we were lucky. A draw would have left Dundee needing to win their last game, whereas now a draw will be enough for them. Dumbarton, even if their play-off hopes are effectively over, are capable of drawing with a jittery Dundee. But the knowledge that a draw is now enough should do wonders for any Dundee jitters. Cooler analysis was what was missing. Neil had looked well able to manage from the pitch earlier in the game, when he countermanded the substitution of Scotland by Antoine-Curier, a decision vindicated by our goal. But in the crucial minutes, the notorious Neil red mist descended. Yes, it was frustrating to concede a goal against the run of play, although we could yet have recovered. Yes, Gilhaney wound him up, and doubtless knew exactly what it took. But the bottom line is that Neil should never have head-butted him, and that's what I saw him do. Ironically, Neil and Chairman Les Gray criticised young Andy Ryan for getting needlessly sent off in the last game of last season. How much more culpable is our experienced player-manager? I don't wish to dwell on Neil's folly; I'm sure he recognises it more than anyone. But if he is to continue to play next season, then as a manager he needs to have a contingency plan for when incidents like this happen, as they will again, although hopefully not in such crucial circumstances. As it was, we looked not just leaderless, but totally disorganised, as we conceded two more goals in the last ten minutes. I'm told some of our young players were crying on the pitch at the end, but by then I had left along with many other disappointed Accies fans. Today's perspective is that we never expected to win the league this season; the play-offs were our target, and we have accomplished that. But we accomplished that a couple of weeks ago, had the chance to go one better, and missed that chance through our own failure yesterday. Hopefully we can pick ourselves up to beat Morton at NDP next Saturday, but we'll be missing quite a few important players. And while that's not likely to be enough to overtake Dundee, it would secure second place and mean we have one less play-off to negotiate. Either way, our prospects for those play-offs look diminished. Time for our players to show their mettle. If Dundee had opened a three point plus goal difference gap yesterday, I would have been prepared to concede. But our late equaliser could yet prove to be one of our most valuable goals of the season. Why does one point make such a difference? With three games left, Dundee could have afforded to lose one and still pip us on goal difference (we're not likely to make up four goals in three games, although it is just possible). Now they can't. If Dundee lose a game and we win our last three, the title will be ours. I'm not saying we'll do it. It's out of our hands now. If Dundee hold their nerve and win their last three, the title is theirs. But I'm not convinced they will. They could draw a game, giving us the slim chance of making up the goal difference. The pressure could get to them. And one or two of their opponents, who still have play-off places to chase (although Alloa's chance should be over before they play Dundee), could actually beat them. TBH, I'm more concerned about us fulfilling our end of the deal. At least one of our remaining games, at Dumbarton, is eminently lose-able. And we are going to be depleted by suspensions, with Hendrie, Gordon and MacKinnon all due to miss games. The pessimists will point out we could even lose second place to a resurgent Falkirk, leaving us an extra round of play-offs to negotiate. Even if we fail to overhaul Dundee, I think it's been a season to be proud of. Accies have exceeded my expectations. In last night's comment to my previous blog, Dave questions the mentality and discipline of our team under Alex Neil. While true, I think this criticism is a tad unfair. We weren't that much better under Billy Reid, and it was to be expected that Alex would stamp this aspect of his personality on the team, along with the more positive qualities he brings - hard work, effective use of the ball, determination, competitiveness, and a winning mentality. I can't share Dave's conclusion that the jury is still out on Alex - for a first full season in management I think he's done no bad. 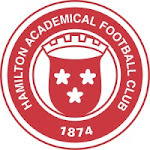 Accies promotion would be "a disaster"
It hasn't attracted much attention elsewhere, but BBC Radio Scotland pundit Allan Preston made a comment yesterday, perhaps deliberately provocative, that promotion for Accies rather than Dundee would be "a disaster" for Scottish football. I'd suggest Alex Neil should pin that up in the dressing room. Yesterday's 1-1 draw leaves our noses still just in front, in what is turning out to be the tightest Championship title race for some time. I'd have taken a draw before the game, certainly when we went in at half-time 0-1 to what seemed a dubious offside goal (it seems Lee Kilday, injured and off the park, played the scorer on), and a draw was a fair result in the end. So now we have just four games to decide things between the two contenders. I don't think Falkirk are back in it, despite their 5-0 win yesterday - too little too late for the Bairns, I think. For Falkirk to win it, even if they win all four of their remaining games, which is far from certain, they need both Accies and Dundee to drop four points each. I can't see it. I think we may well drop points, but we won't both drop enough to hand it to Falkirk. I hope Preston's disrespectful comment helps make a difference. Bring on the "disaster"!